East Lake View Neighbors | To improve the quality of life in our neighborhood through active citizenship, fostering a sense of community, and charitable works. This entry was posted in Uncategorized on November 26, 2018 by elvn_updates. TUESDAY, NOV 13 AT 7:00 P.M.
i. Pay your 2019 annual dues at the Holiday Party! 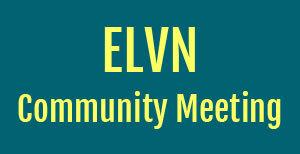 This entry was posted in Community News on November 6, 2018 by elvn_updates. TUESDAY, OCT 9 AT 7:00 P.M.
between local LSD and Broadway; any issues? This entry was posted in Uncategorized on October 8, 2018 by elvn_updates. 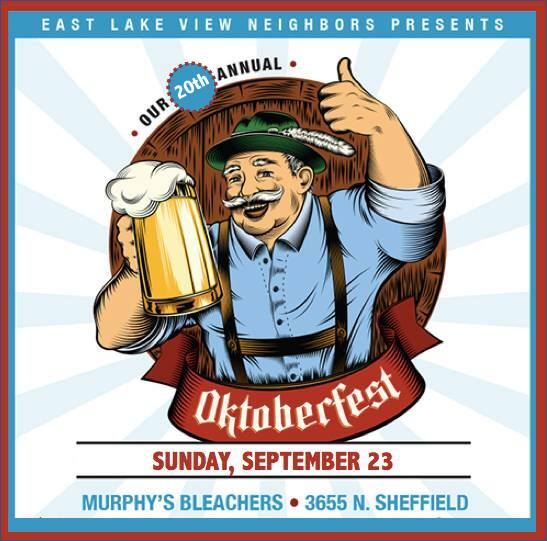 Join us at our 20th Annual Oktoberfest on Sept 23! 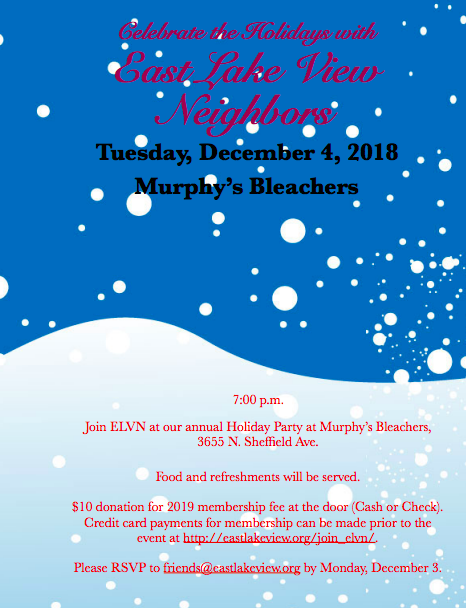 Purchase tickets from any one of ELVN’s board members (full list here) or visit Murphy’s Bleachers to pick up tickets at the bar! Previous Sponsors include: Murphy’s Bleachers, St. Joseph Hospital, The Dougout Sports Bar & Grill, Ticket Window, Testa Produce, Sysco, Patch Landscaping, Wrigley Rooftop Association, Roundy’s Supermarkets, 3639 Wrigley Rooftop, Chicago Beverage, HK Foods, Skokie Valley Beverage, Penske Truck Rentals – Wrigleyville, Four Corners Tavern Group, Chicago Roof Deck & Garden, Wells Street Popcorn, Beyond The Ivy, John Barleycorn, Carissima Salon, Frame Factory, Central Lakeview Merchants Assoc., Skybox on Sheffield, Louis Glunz Beer, Trader Todd’s, Old Chicago Inn, Wrigley Rooftops, North Halsted Business Alliance, Central Federal Savings, Brixen Ivy, Sutcliffe Pharmacy, Wrigleyville Rooftops, Chicago Cubs, River North Sales & Svc., Gold Coast Tickets, El Mariachi Tequila Bar & Grill, Lakeview East Chamber of Commerce, and many more Chicago businesses. This entry was posted in Uncategorized on September 5, 2018 by elvn_updates. TUESDAY, SEPT 4 AT 7:00 P.M. This entry was posted in Uncategorized on August 27, 2018 by elvn_updates. TUESDAY, MAY 1, 2018 AT 7:00 P.M. This entry was posted in Uncategorized on April 23, 2018 by elvn_updates.